Experience an unforgettable stay at Hooters Casino Hotel Las Vegas, located just a block away from the famous Las Vegas Strip. 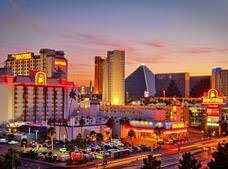 Though the hotel is considered small by Las Vegas standards, guests can enjoy traditional delights like beautiful swimming pools, an impressive casino and even a tattoo parlor. Several restaurants and bars are located onsite and nightly entertainment is also provided.